The abbey was originally founded in 1293 as a Cistercian abbey, however the Protestant reformation resulted in the decline of the abbey. In the 1600s, the support of Stift Wilhering, which you pass as you drive from Linz to Engelhartszell, enabled to abbey to recover. However, the abbey was dissolved by Emperor Joseph II in the late 1700s. This is the same period in which the stunning abbey church was built in (1754). Expect stunning Rococo details and well maintained religious artwork by famous painters of the time. The abbey was re-established as a priory in 1925 by German monks who left Alsace after World War II. In 1931, the priory become an abbey. However, the abbey was confiscated by the Nazis in 1939. The monks fled and a number of monks were imprisoned by the Gestapo or sent to concentration camps. Four of these former monks died at the hands of the Nazis. Only a fraction of the monks returned after World War II, however monks from the Bosnian Mariastern abbey helped recover their numbers in the post-war period. Stift Engelszell abbey is the only Trappist abbey in Austria. If you wish to attend a service, you can join the monks for mass on Sundays at 9:00. (Note: they hold services in a different heated building in winter.) In general, the church is free to view and is open during the day between 8am and 5pm (7pm during the summer). The shop is open between 9am and 5pm during the summer. During the winter, they have more limited hours on the weekdays with longer hours (10am to 6pm) on weekends. If you want to take a tour, you need to email or call the monastery in advance to book a tour (pforte@stift-engelszell.at or +43/7717 / 8010-0). With a larger group, more is possible, including a small church tour with a liqueque tasting or a larger cloister tour with a tasting. Beer lovers may want to reserve a brewery tour with a beer tasting although this required ten people, so we were unable to take the tour. Stift Engelszell is the 8th Trappist brewery in the world although their production is quite small (2,000 hectoliters). They were allowed to put the Trappist product logo on their beer as of 2012, which is when they started brewing their beer. We struggled to find their beers in nearby Linz without driving out to try them. They do not supply the cafes in town with their beer, so you’re out of luck if you’re looking for a cozy cafe (similar to Westvleteren). I did see their beer sold at Stift Sankt Florian and you can find it at a number of monastery shops around Austria. The main beers that you’ll find at Stift Engezell are the Gregorius, Benno, and the Nivard. After asking the one staff member for her recommendation, she told me that Nivard was easily her favorite. You can purchase these by the bottle depending on their availability. 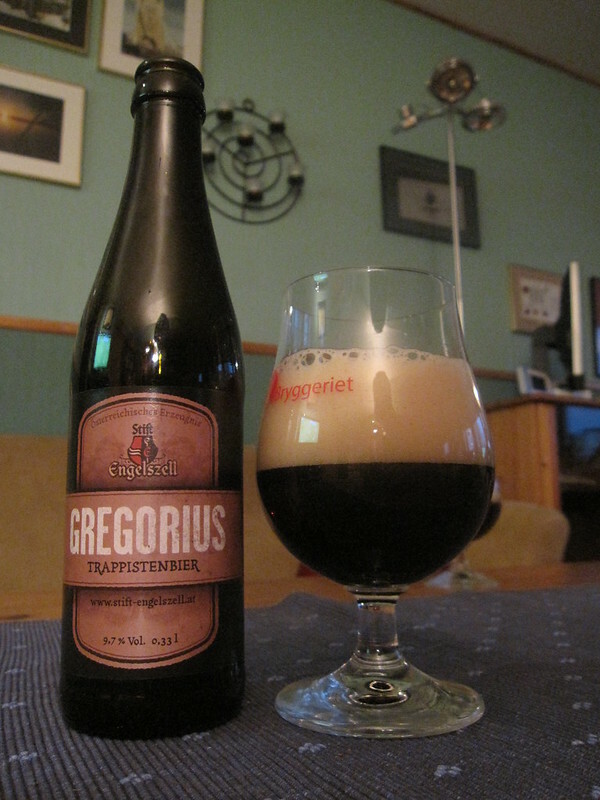 We tried the Gregorius, which was my husband’s favorite. This 9.7% ABV beer has a malty, chocolatey taste. Personally, it was too dark for me as I preferred the Nivard. This Belgian Pale Ale (5.5% ABV) has a slight organgy taste that isn’t overwhelming or not too bitter. Unfortunately, they were out of the Benno, which is their hoppy triple. They also produce limited edition beers. My husband ended up purchasing their Cervisia Stanacum, which was a rich, flavorful, and complex beer. It reminded me of a Kentucky barrel aged beer, but you will need to drive out to the monastery for the beer as you can only purchase this beer at the monastery in 75cl bottles. You can purchase beers with a credit card or cash. They do have an online shop, but they write that they only ship to Austria and Germany at the time. Be sure to pick up the chocolates at the monastery if you’re a chocolate lover! The monks make chocolate nuggets as well as liquor filled chocolates. I especially enjoyed the chocolates, so consider picking these up as they were absolutely delicious to eat. They also sell cheese, which is supposed to be delicious. Most notably, they produce their own liquors. I ended up asking one of the employees about her favorite and she recommend the Apricot (Marillenlikor). We struggled with the decision of which one to choose, so choose carefully. They sell the liquors in three sizes, including a “mini” airplane trial size. This is great if you’re just curious to try their homemade liquor. You can purchase their liquors at a number of Austrian supermarkets in Upper Austria, including Spar in Linz. It is very easy driving from Linz, Austria to the Engelhartszell, the town the monastery . The route is beautiful and picturesque as you drive past many stunning castles, forest, cute towns, and castle ruins. The drive should take about an hour with no traffic. I’d recommend this route foremost as it gives you the most flexibility and we loved exploring the castle ruins alogn the way! You can take a scenic ferry along the Upper Danube valley with taking your bike for 2 euros extra almost daily (check the schedule) with Donauschiffahrt although you can’t return the same day. From Passau (in Germany), you can take a ferry to Engelhartszell. From Linz, it’s also possible to take a bus (Bus 670) towards Engelhartszell as a day trip. Check the bus times carefully unless you intend to stay overnight. We saw many bikers out on the scenic hills surrounding the monastery. It would be doable to do a leisurely overnight bike trip from Passau, which is only 85 kilometers away. Have you been to Engelhartszell?